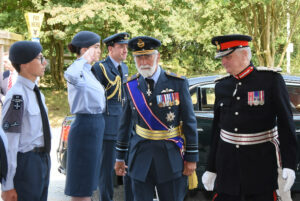 Even in the presence of royalty, the Few inevitably steal the show – and it was Wing Commander Paul Farnes DFM who did just that at July’s Memorial Day commemorations at the Battle of Britain Memorial at Capel-le-Ferne, near Folkestone. 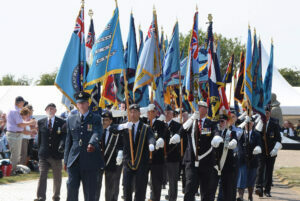 Wing Commander Farnes, two weeks short of his 100th birthday, took centre stage at a moving event that included a display by a Spitfire from the Battle of Britain Memorial Flight and music from the RAF Central Band. 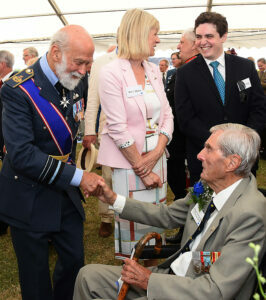 The event was held in the presence of the Trust’s Patron, HRH Prince Michael of Kent GCVO, who was welcomed by the Lord- Lieutenant of Kent, The Viscount De L’Isle MBE. 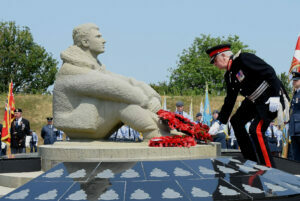 As well as marking the 25th anniversary of the unveiling of the National Memorial to the Few by Her Late Majesty Queen Elizabeth The Queen Mother, this year’s Memorial Day marked the 100th anniversary of the RAF.